Dr. Charika Marasinghe holds a Bachelor of Laws Degree from the University of Colombo, Sri Lanka, and a Master of Letters and a Doctorate in Law from Oxford University, United Kingdom, specializing in International Human Rights Law. 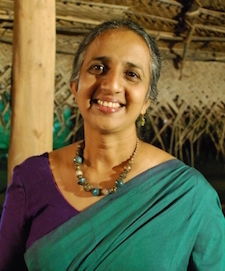 She was a Senior Lecturer, Faculty of Law, University of Colombo, a member of the National Child Protection Authority; and a Trustee of the Vishva Niketan International Peace Center. Dr. Charika Marasinghe currently serves on the Executive Council of the Sarvodaya Movement the (largest NGO in Sri Lanka). She herself began the Savordaya’s legal aide program and is well known internationally in the field of children’s rights. She joined hands with Sensei Joan Hogetsu Hoeberichts of the Heart Circle Sangha of the USA, bringing psychotherapeutic counseling skills to para-professionals in Sri Lanka who then counseled survivors of the Tsunami disaster. Dr. Charika Marasinghe possesses 22 years of experience in Human Rights Law. At present she is a freelance human rights law consultant.